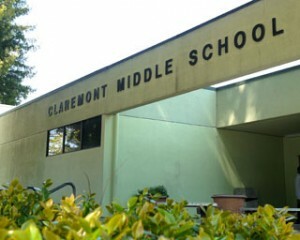 Claremont Middle School is a public middle school for grades six through eight, located adjacent to the Rockridge BART Station near the northern border of Oakland, California. The school serves about 440 students within the Oakland Unified School District. In addition to fundamental education in the OUSD mathematics, language arts, science and social studies curricula, Claremont provides professional digital media training in a state-of-the-art computer lab, an exceptional music program, an active sports and physical education program and a multifaceted after-school program.